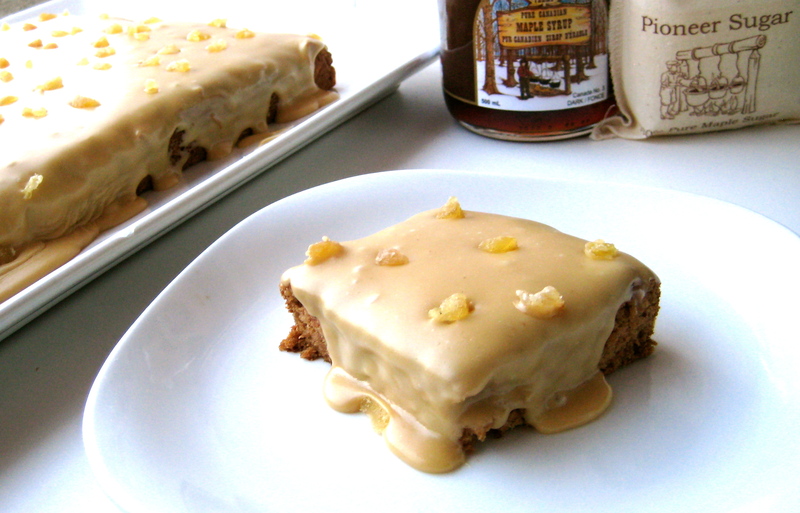 I love maple syrup, and I have a whole slew of maple recipes in my drafts ready to go. If there is one thing that I love about living in this region, it’s that I live down the street from a maple syrup farm. Conveniently delicious. Light, fluffy, and moist, with a big maple flavor, this cake will become a standard in your baking repertoire, and uses fruits, veggies, whole grains and unrefined sugar. Preheat the oven to 350°F. Lightly oil a 9×13-inch baking pan and dust it with sorghum flour, tapping out excess. Put the sorghum flour, millet flour, tapioca flour, arrowroot flour, baking soda, xanthan gum, ginger, baking powder, cinnamon, and salt in a large bowl. Whisk well to combine. Add the parsnips and the raisins. Mix well. Put the maple sugar and buttery spread in a stand mixer or large bowl. Using the stand mixer or a hand mixer, beat for 2 minutes, until creamy. Add the applesauce and vanilla extract. Mix well. Turn the mixer to low speed. Alternately add the flour mixture and the “buttermilk” in three additions, beginning and ending with the flour mixture, until well-combined. Scrape the mixture into the prepared pan, smoothing evenly. Bake for 23 to 26 minutes until the cake pulls away from the sides of the pan and a toothpick inserted in the centre of the cake comes out clean. Let cool in the pan for 10 minutes, then invert onto a cooling rack to cool completely. To make the frosting, put the buttery spread, macadamia nut butter, and salt in a stand mixer or large bowl. Using the stand mixer or a hand mixer, beat for 2 minutes, until creamy. Add the arrowroot flour and 1/2 cup of the icing sugar. Beat until well-mixed. Turn the mixer to low speed and slowly stream in the maple syrup until well-combined. Turn the mixer to medium-high speed and beat for 2 minutes. Add the remaining 1/2 cup of the icing sugar and beat for an additional 1 minute. If you prefer a thicker frosting, you can add additional icing sugar, but it will be much sweeter. Spread the frosting on the cooled cake, then sprinkle with the candied ginger. Serve at room temperature. Note: To make vegan “buttermilk” for this recipe, put 1 tablespoon cider vinegar in a liquid measuring cup. Add enough nondairy milk to total 1/2 cup. Let sit 5 minutes until curdled. This sounds so good! I envy you living so close to a maple farm, maple syrup here is insanely expensive. We only use a wee little drizzle at a time. It is pricey, but I don’t think overly expensive for the really good stuff — maple sugar, dark and amber maple syrups… they make all of the difference! I recently saw maple sugar at Costco, though, for a relatively good price. Thanks for the comment, Kittee! Very creative use of the sweetener! Thank you! But the keywords here are that you live in –what I assume is–beautiful Northern California. Can I come visit with some maple products in tow?